How did your week start off ? Well, I wish I could say I'm having the greatest time ever but with college reopened, I'm finding myself sleep-deprived and lack-luster. I really, really need to start sleeping earlier and I will probably do an Inspiration post to get my head back on my shoulders. I've mentioned earlier that at one point, I was not very experimental when it came to fashion. A certain style of shoes would just not suit me, that hairband would just not work on me and that colour is something I cannot pull off. Grey was one such colour and in the few months of blogging, I've definitely been won over by this demure shade as you can see here and here. One very early morning, when I wanted to try something other than the bland jeans and a t-shirt, I put this together. Yes, I maybe OD-ing of grey, but the truth is, its sort of become one of my favorite colours. This was the first time I wore those because I had always been skeptical about how I should wear them. Well, now I know. And the smurfs ? Well, cartoon and comic characters and never really go out of style. Now If I could get my hands on a cool Flash t-shirt. Also, I've started a new thing on Facebook. Its an album called 'What I'm in' which is basically a few rough pictures of what I'm wearing that day because its not always possible to blog about every outfit. You haven't seen it yet? Well then join in on the Sunkissed page and check it out! 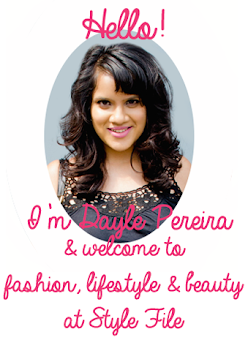 To all the new followers here and on Facebook - Hi :) It feels great to have you guys read my blog. Keep reading and don't worry, I'll keep writing! It has been a tiring week - the early morning college lectures have started plus I had to attend a couple of occasions. Between all of this, I'm kinda trying to find my centre of balance right now because, everyday by the time I'm back home - I'm so exhausted, I can probably fall into a slumber then and there! It'll take a few weeks but I'll probably get used to the 'rising-before-the-sun' deal. I hope. I have these high-waist pants which I've planned to wear twice before. The first time the pants weren't altered and the second time, I lost the will to go out itself. I was starting to think that my pants were cursed until last weekend where I went for a family dinner. Dont you just love a bright pop of colour ? I do, specially when hot pink is somehow involved. I also wore a fushcia lipstick to match my belt and livestrong band. Tee hee. The weather has started getting a little chillier *jumps for joy* and I actually got a chance to wear a cardigan this morning. Cmon now Weather Gods, make it snow! Doesn't it look like I've skipped a few months and jumped into spring ? Well, skipping &everything , I love this outfit - manageble and feminine :) Also, If you are someone who travels around on a daily basis and cannot afford to be in heels 24*7, wedges will save your life. Really. I'm in my last week of holidays now & I plan to make the most of it. And don't worry, you will get to see what I'm wearing while I'm making the most of it. Buh-bye dolls! We'll talk soon - Have a great day! This post is also my entry for the Indian Fashion Blogger's Floral Remix ! Do join in! Which girl didn't grow up reading fairy tales ? I remember sitting down with a hardbound Disney book I had got as a Christmas present and reading about Captain John Smith doing everything he could to win the approval of Pocahontas' family or the beautiful Belle finding that the Beast had a pure heart. I grew up reading fairy-tales and every once in a while, right before my eyes, I've seen them come true. I had to attend a Silver Jubilee at the Taj which called for a formal dress code. Dress - Rise London, Platform stilettos - Zara. The ambiance of the place was magical, with everything bathed in pink light. The theme for the occasion was Arabian Nights, so everything had a middle eastern tinge to it, from the head-scarves that were provided to the music. On the whole, a beautiful evening. How has the week been dolls? I've been sleeping in late and watching a lot of TV . Also, shopped with mom and she bought me an essential I was lusting after for ages. Now what that is, is a mystery ;) But as I said previously, don't fret, everything will be featured here soon ! That reminds me, Wish-list, coming up soon !